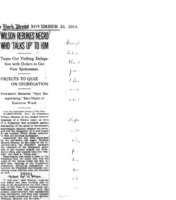 Date is exactly "1914 November 13"
Recounting incident in which white men and women objected to African-American men and women eating with them and the African-American's were moved. Commending Wilson on his handling of the Trotter incident. 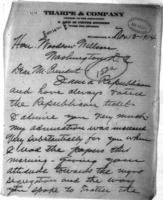 Republican commends Wilson’s treatment of Trotter and says "Republicans of the South believe as you do." 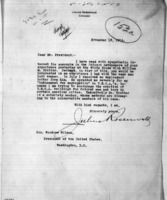 Letter to Woodrow Wilson commending segregation in the federal government and regretting Trotter incident. 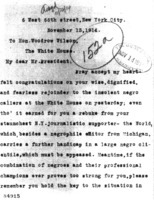 Roundtree writes the President to assure him that "the country don't approve of Mr. Trotters' insult to you." 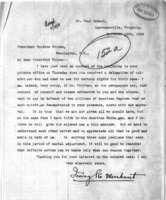 Letter recounting an experience Rosenwald had with William M. Trotter, who said Rosenwald was inducing segregation in his attempts to build YMCAs for African Americans. 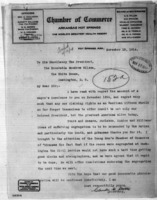 Letter regarding the Trotter incident and the custom of appointing an African American to the office of Recorder of Deeds in the District of Columbia. Writer apologizes for Trotter’s conduct and says the races need to understand each other better. Letter writer supports Wilson's rebuke of Trotter. Letter writer hints at harming Trotter if Wilson sends him to Baton Rouge. Letter giving justifications for segregation and saying that African Americans have caused the "degeneration of the White Southern race." 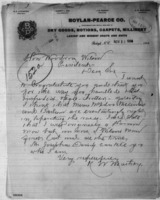 Letter to Wilson congratulating him for his "kind words... to Chairman Trotter." 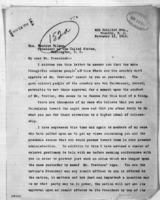 Letter to Wilson congratulating him on his "wise, dignified, and fearless rejoinder" to Trotter. Newspaper clipping from the New York Press recounting the Trotter incident. 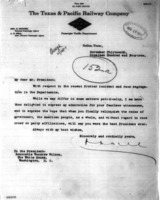 Letter on Texas & Pacific Railway Company letterhead commending Wilson for his response to the Trotter incident. AME Zion church pastor apologizes for Trotter, who shouldn't have approached the President at a time when the President was busy with international affairs. 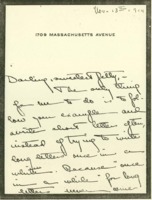 Eleanor Wilson McAdoo writes Jessie Wilson Sayre to thank her for a birthday present and note.